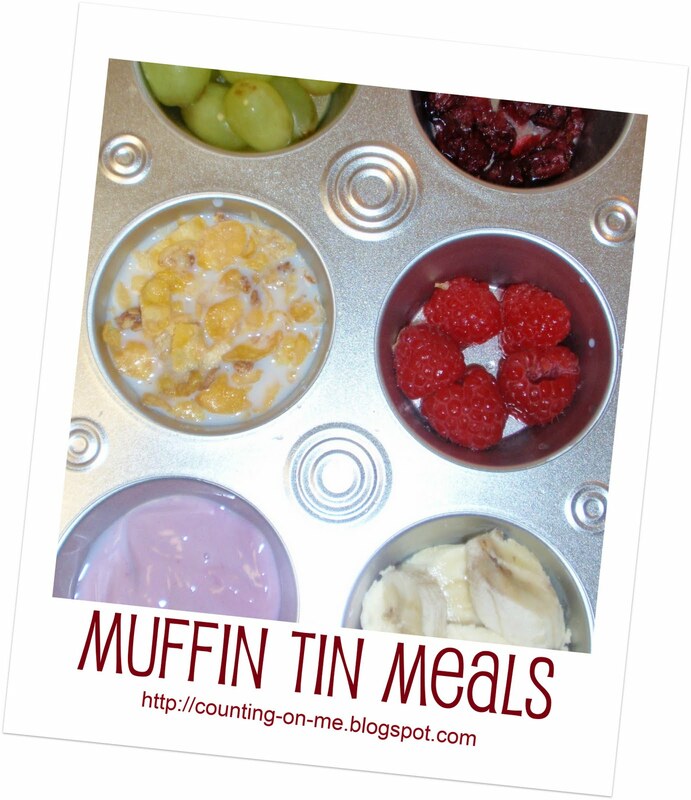 Have you tried Muffin Tin Meals for your little ones yet? I've seen lots of posts about them all around Blog Land, but hadn't tried them until recently. I only had full-size muffin tins (with 12 cups), so I purchase four 6-cups muffin tins at The Dollar Tree especially for muffin tin meals. The cups in the tins are regular size, but the tins themselves are small (just six cups). At first it was a little bit of a challenge for me to come up with six healthy, balanced servings of kid-friendly foods, but it gets easier and my girls really love them! Can you tell she loves them? So cute! I can't wait to try this. I also linked to your blog today- Saw your 101 things to do with a toddler on Pinterest! Thanks for sharing. That is the cutest, funniest picture ever. I really like this idea...I have a 3 year old who hates trying new foods, especially nutritious ones...and who always wants dessert. Before dinner! So I might try this and tell her she can have dessert if she eats at least 4 of the 6 muffin cups of food. That way she has power and choices! I hate figuring out how to avoid the "clean your plate" mentality, but I can't in good conscience give her an amount of dessert that exceeds the volume of healthy food she has eaten! New follower! I can't wait to try this out with my toddler! LOVE this! Thanks for the idea! This is such a clever idea. I'll have to stop by the Dollar Tree to pick up a few of the tins. And that is just the cutest picture, look at those adorable cheeks!!!! Ohhh my goodness, I wasn't going to comment until I saw that precious picture of your little one. I laughed out loud and smiled seeing her joyful expression! Such a fun and creative way! Kids really do love trying out new stuffs. And they wouldn't miss out the fun in having their meals thinking that they're like playing at the same time. Can't wait to try this with my 6 year old. It will encourage her to try new things, eat healthier and control portion sizes. Can be used for any kids, not just toddlers. © Shannon Brennan 2014. Powered by Blogger.